VALLETTA, MALTA (AP) — A group of migrants desperate not to go back to Libya made it safely to Europe on Thursday after commandeering the oil tanker that rescued them at sea — a drama that underlined contradictions in Europe’s migration policies and could discourage future rescues. Both Italy and Malta initially refused entry to the Palau-flagged El Hiblu 1. But Maltese armed forces intercepted it overnight after confirming with the captain that he was navigating toward Europe against his will. Special forces boarded it and restored control to the crew. The 100 migrants, including 15 women and 47 claiming to be minors, left the tanker in a port near the Maltese capital of Valletta; five were handcuffed after being detained on suspicion of being the ringleaders. Italy’s hard-line interior minister called the hijacking the “the first act of piracy on the high seas with migrants.” But humanitarian groups rejected that label, saying they were victims of “Europe’s inhumane border policy,” citing reports that many migrants have been mistreated, raped and tortured in Libya. The German humanitarian group Sea-Eye said its rescue ship, the Alan Kurdi, was in the area of the El Hiblu 1 when it heard radio communications between the tanker and a European aircraft monitoring the seas. The aircraft asked the tanker to respond to two rubber boats, saying that the people on board were “in mortal danger” and that the Libyan coast guard was “out of service.” After the rescue, the captain reported to the aircraft that the migrants “are very upset and do not want to be brought back to Libya.” However, the captain said the Libyan capital of Tripoli was the tanker’s destination. Migrants have long reported that commercial ships either ignore smugglers’ boats in distress, or merely stop to give them water, said Hassiba Hadj-Sahraoui, humanitarian affairs adviser with Doctors Without Borders. Similar incidents could accelerate the trend. The International Chamber of Shipping based in London expressed concern about the incident and said it would raise the issue with the U.N. International Maritime Organization. The European Union has been training the Libyan coast guard in the hope that it will prevent migrants from entering international waters, where they have routinely been rescued, either by commercial ships or those run by humanitarian groups filling in the void after member countries significantly scaled down an EU operation in the Mediterranean. But the contradiction lies in the fact that no EU member considers Libya, or any other northern African country, to be a “safe third country” where migrants can be returned without fear for their well-being. The EU also opposes the death penalty, and in extradition cases generally refuses to send people to countries where they might be killed or tortured. Matthew Brook, the acting representative for the U.N. refugee agency in Libya, told reporters in Geneva that the conditions for many migrants in government-run detention centers in Libya were “terrible.” He relayed an anecdote from some migrants that electric shocks were administered to them in vats of water. While Europe is reducing its own rescue mission, Italy and Malta have refused to accept aid group rescue ships in their ports. That has led to offshore standoffs with boats loaded with migrants, often weak from their journey and mistreatment in Libya, while EU nations haggle over their fate. Many humanitarian groups have stopped taking part in rescues; in fact only the Alan Kurdi is currently active in the central Mediterranean. Doctors Without Borders suspended their operation in December due to port closures, administrative pressure on Panama to pull its flag, and containment measures meaning that fewer migrants were making it past the Libyan coast guard. The policies have had the effect desired by populist leaders like Italian Interior Minister Matteo Salvini. Migrant arrivals in Italy were down dramatically last year to 23,370 from nearly 120,000 a year earlier, according to Interior Ministry figures. Deaths at sea also sank to the lowest levels in five years, 2,299, according to the International Organization for Migration. Details of what happened aboard the El Hiblu 1 remains sketchy, but the fact that the migrants made it to European soil makes it unlikely that they would be sent back to Libya. Naval tracking signals show that the tanker was headed straight toward Libya when it deviated from its course, presumably for the rescue. After resuming toward Libya, it abruptly turned northward, suggesting the moment the hijackers took over, heading toward the island nation of Malta or Italy’s southernmost island of Lampedusa. Maltese armed forces established communications with the captain while the ship was still 30 nautical miles offshore. 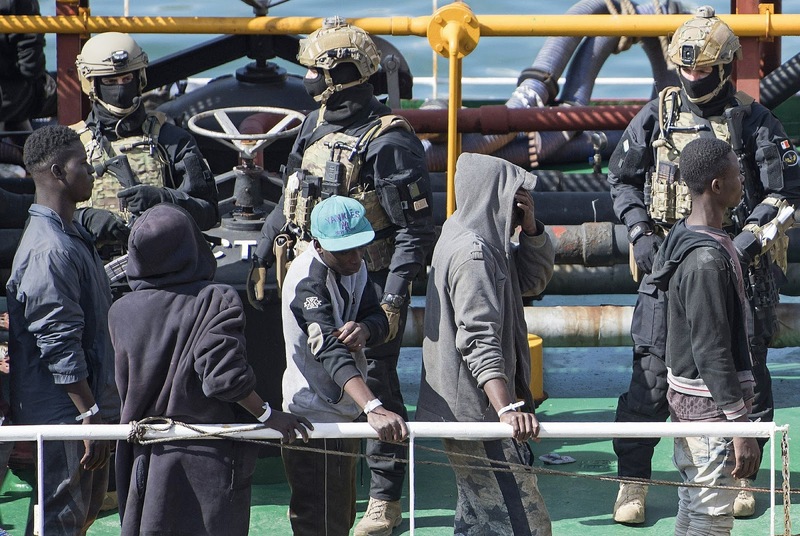 The captain said he was not in control of the vessel “and that he and his crew were being forced and threatened by a number of migrants to proceed to Malta,” the armed forces said. A military official who spoke on condition of anonymity because he was not authorized to talk to the media said the migrants did not have weapons, but that the captain and crew were outnumbered and forced to surrender. 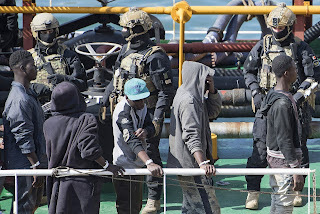 Special forces backed by a patrol vessel, two fast interceptor craft and a helicopter regained control of the ship, and it was escorted back to Malta with armed military personnel standing guard on deck. The condition of the crew was not known, and they were not seen exiting the tanker. Malta officials said they were also being questioned. The vessel’s owner, Salah al-Hiblu, said from Tripoli that the tanker was empty and was being captained by his brother, Nader, from Turkey. He said he received a call from Libyan naval guards, who asked him to contact his brother to rescue the migrants. They had resumed the voyage to Tripoli when the migrants “used force” and told him to go to Italy or Malta. “The migrants told him, ‘we are not leaving or going back to Libya. We already left Libya to go to Europe,’” al-Hiblu said. Barry reported from Milan. Associated Press writers Maggie Michaels in Cairo, Lorne Cooke in Brussels, Jamey Keaten in Geneva, Lori Hinnant in Paris and Vanessa Gera in Rome contributed.